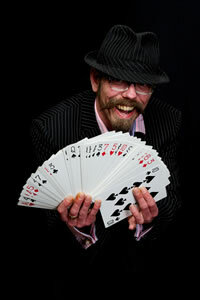 Performing for weddings, parties, corporate functions, bars and restaurants Jeff's friendly and fun approach to all guests puts them at ease and gets them involved in the magic itself. 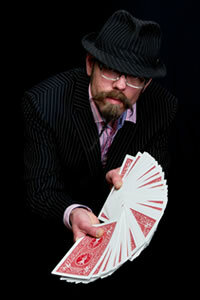 Style of performances can be decided before hand, whether you prefer magic or a more mentalist angle, although Jeff is great at sensing what his current audience are more likely to enjoy and adapting his display on the fly. Cards are his forte, although he is far from limited to this, blending them with an engaging use of mind reading and unbelievable mental displays alongside magic with everyday items and borrowed objects. You really do never know what's going to happen next! You may even get to see his renowned "balloon trick". Currently resident magician at one of the busiest bars in town, he may still be available to entertain at your next event.